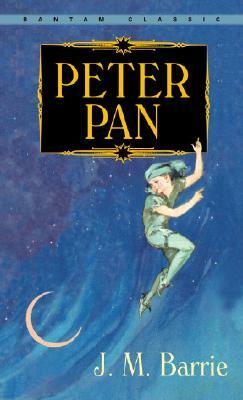 Considered a masterpiece since its first appearance on stage in 1904, Peter Pan is J. M. Barrie’s most famous work and arguably the greatest of all children’s stories. While it is a wonderful fantasy for the young, Peter Pan, particularly in the novel form Barrie published in 1911, says something important to all of us. Here “the boy who wouldn’t grow up” and his adventures with Wendy and the lost boys in the Neverland evoke a deep emotional response as they give form to our feelings about parents, boys and girls, the unknown, freedom, and responsibility. Humorous, satiric, filled with suspenseful cliff-hangers and bittersweet truths, Peter Pan works an indisputable magic on readers of all ages, making it a true classic of imaginative literature. Sir James Mathew Barrie was born on May 9, 1860, at Kirriemuir in Scotland, the ninth of ten children of a weaver. When Barrie was six, his older brother David died in a skating accident. Barrie then became his mother’s chief comforter, while David remained in her memory a boy of thirteen who would never grow up. Barrie received his M.A. degree from the University of Edinburgh in 1882 and began working as a journalist. In 1885 he moved to London, and his writings were collected in Auld Licht Idlls (1888) and A Window in Thurns (1889), which, together with a sentimental novel, The Little Minister (1891), made him a best-selling author. In 1894 he married an actress, Mary Ansell, but the marriage was profoundly unhappy, produced no children, and was dissolved in 1910. However, a favorite Saint Bernard dog of Mary’s later became the famous Nana of Peter Pan. In 1897, with the adaptation of The Little Minister, Barrie became a successful playwright, writing the plays The Admirable Crichton (1902), What Every Woman Knows (1903), and Peter Pan (1904), which was produced in 1904 and revived in London every Christmas season thereafter. While the figure of Peter Pan first appeared in Barrie’s book The Little White Bird (1902), the story and the concept began in the tales Barrie told the sons of Mrs. Sylvia Llewelyn Davies, a woman Barrie loved. Barrie then published the story of Peter Pan in book form as Peter and Wendy (1911). The best of Barrie’s later works is Dear Brutus (1917), a haunting play that again brought the supernatural and fantasy to the London stage. Barrie died in 1937, bequeathing the copyright of Peter Pan to the Great Ormond Street Hospital in London, a hospital for children.